You’ve been in this situation before. You’re at the dentist’s office and the dental hygienist is giving a teeth cleaning, asking you if you floss. Most of us don’t, or most of us don’t do it enough. Your dentist will give you spiels about the importance of it. And it is important. But there are also some cons to consider when deciding to finally commit to a flossing regiment. From different types of floss to strategies in flossing itself, there are plenty of ways to both boost the hygiene of your mouth and do damage at the same time if you don’t pay attention. Flossing is necessary, but too much, the wrong way, can do more harm than good. You may have questions about the exact effects of flossing and may not have time or the ability to consult a dentist right away. We’ve outline them below so you can arm yourself with some knowledge and research before talking to a professional and starting a flossing regiment. 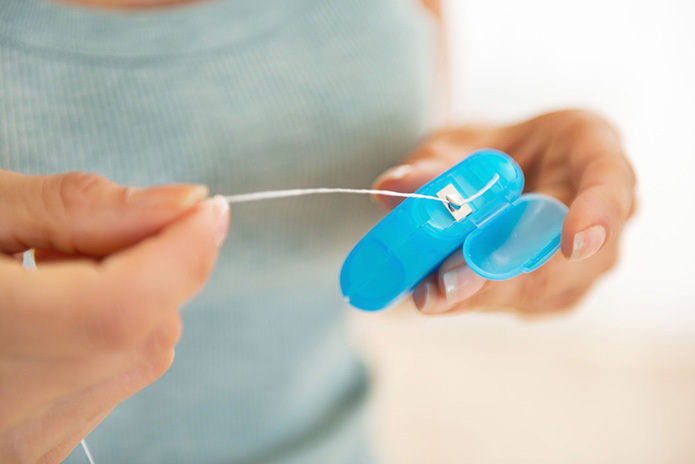 The most common types of floss you’re going to encounter are waxed and unwaxed floss. If you’re not sure which is which, wax floss is, more often than not, the floss that has flavoring. Both are made of nylon strands but waxed floss, as the name implies, has a waxed coating. Unwaxed floss is less sturdy but can get in tighter spaces easier. Waxed floss slides easier between teeth but can leave residue that’s uncomfortable to some. In both cases, however, there is going to be abrasion on the gums to clear out base level plaque. And both of these floss types can’t really be utilized by those with braces or spacers. There’s plenty of commercial water flossers out there. They’re much easier on the gums, more soothing for people with sensitive gums, and are generally a better experience all around. They also have the added benefit of targeting deep bacteria pockets in a way that nylon floss cannot. However, they can’t remove plaque as effectively as nylon floss and, therefore, isn’t considered a substantial form of flossing by the ADA. Are There Other Flossing Options? The two flossing types above are the most common flossing techniques. But there are others if neither is appealing. Dental tape is an option for those with wider space between their teeth. For those who don’t like the way nylon floss tears away easily or have tighter spaces between teeth, there is a polytetrafluorethylene floss that’s incredibly durable and is very good at getting into tight spaces between teeth. While everyone benefits from flossing later in life, not everyone is ready for it. First of all, you need a fairly full mouth of teeth to do it in a way that won’t cause pain. You also need a fair bit of dexterity to accomplish the task and kids often aren’t able to do this on their own. You should start helping them floss around the age of 6 and allow them to floss on their own by the age of 10 yrs. Flossing is more complicated than you think. There are ways to do it right and there are ways to do it wrong. Talk to your dentist about what you want to get out of flossing and your overall concerns for your dental health. At Sedki Dentistry, we want every patient to have the best oral and dental health possible, so we make it a priority to educate and demonstrate dental tips and techniques for optimal results. As a general and cosmetic Family Dental Practice, we offer services for all dental health concerns. Our team is experienced in Cosmetic Dentistry, Dental Treatments, Dental Procedures, Invisalign, Teeth Whitening, Dental Implants, Orthodontics, Children’s’ Dentistry and more! Call us at 248-360-9620 today for an appointment and Free Dental Consult!